The Jewish Museum in New York will present Chagall: Love, War, and Exile which, for the first time in the U.S., explores a significant but neglected period in the artist's career, from the rise of fascism in the 1930s through 1948, years spent in Paris and then in exile in New York. MARC CHAGALL (1887-1985), one of the foremost modernists of the 20th century, created his unique style by drawing on elements from richly colored folk art motifs, the Russian Christian icon tradition, Cubism, and Surrealism. Beginning with the evocative paintings from his years in France, Chagall: Love, War, and Exile illuminates an artist deeply responsive to the suffering inflicted by war and to his own personal losses and concerns. Although he never abandoned a poetic sensibility, his art of the 1930s and 1940s reflects the political reality of the time. Most unexpected is the recurring appearance of the figure of the crucified Jesus as a metaphor for war and persecution. By the mid-1940s, Chagall returns to joyful, colorful compositions expressing the power of love. The exhibition includes 30 paintings and 24 works on paper, as well as selected letters, poems, photos, and ephemera. Escaping the hardships of Soviet life following the Revolution, Marc Chagall moved to Paris with his wife, Bella, and daughter, Ida. During this productive period, he assimilated the French artistic tradition, creating a series of portrait-like flower paintings, vibrant in color and texture. Chagall's exile from Russia also inspired work based on memories of his childhood and of the Bolshevik Revolution. He depicted a cathedral that dominated the town of Vitebsk, and drew on a remembered storehouse of symbols meaningful to both Jews and Christians, presaging the Christian imagery-in particular the Crucifixion-in work to come. Like many Eastern European Jews who had fled to France, Chagall's world was threatened by the rise of Nazism. In 1941, with an invitation from Alfred Barr of the Museum of Modern Art, he and Bella escaped to New York City. With the onset of the war and this second exile in New York, themes of violence and disruption characterize Chagall's work. The most prevalent image used by Chagall during World War II was of Jesus and the Crucifixion. In Chagall's canvases Jesus was often depicted as a Jew. For the artist, the crucified Jesus was a symbol for victims of persecution, and an appeal to conscience that equated the martyrdom of Jesus with the suffering of the Jewish people. While other Jewish artists depicted the Crucifixion, for Chagall it became a frequent theme. Unlike his years in Paris, Chagall was never completely comfortable in New York City. The artist felt disconnected from the places he understood best-Russia and Paris. This feeling of alienation was compounded by a devastating personal tragedy-the sudden death of his wife, Bella, in September 1944. Marc Chagall soon established a new relationship with Virginia Haggard McNeil, moving with her to High Falls, New York in the mid-Hudson Valley. His work from this time often expresses a tension-between the memory of Bella and the new presence of Virginia-resulting in fraught but revealing compositions. Gradually, as the artist emerged from his sadness, and the horrors of war receded, the work from this period begins to reflect a more familiar Chagall expressed in joy-filled paintings replete with intense color and levitating figures. The show brings together significant works from major institutions and collections throughout Europe, Israel, South America, and the United States. 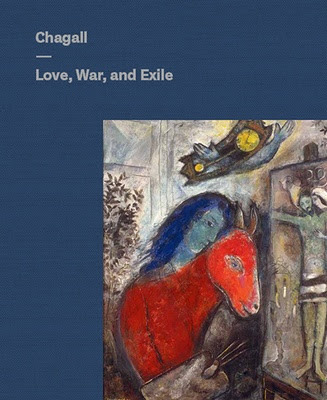 Chagall: Love, War, and Exile is organized by Susan Tumarkin Goodman, Senior Curator at The Jewish Museum. In conjunction with the exhibition, The Jewish Museum and Yale University Press are co-publishing a 148-page catalogue by Ms. Goodman, with an essay by Kenneth E. Silver, Professor of Art History at New York University. Goodman and Silver analyze Chagall's complex iconography and phantasmagorical style, tracing the political, literary, and theological sources that inspired his art. Also included are 72 color reproductions, 27 black and white illustrations, and eleven of Chagall's rarely seen poems.